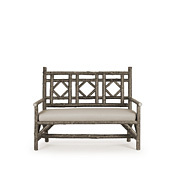 The striking “diamond back” motif is truly a stand-out design element on this Rustic Settee. Created with eco-friendly construction and master upholstery, it's perfectly suited to grace many different room types and decorating styles. Customer’s own Leather: 26 sq. ft.
Customer’s own Leather: 30 sq. ft.
All seating is handmade in Wisconsin using locally harvested willow, poplar, or cedar woods using sustainable, efficient, and extremely eco-friendly manufacturing methods. See Eco-friendly. Prices for all seating include cushion and pillows in your choice of one of our twenty La Lune Collection indoor/outdoor fabrics or in the Customer’s Own Material (COM). Additional fabrics are available at a surcharge. See the Additional Fabric Options below. Loose seat cushions are filled with high density foam wrapped with fiberfill with cording/welting on all seams, and with removable zippered covers. Back pillows are filled with Comforel (a soft down substitute) with cording/welting on all seams and with removable zippered covers. Please contact us if you require any additional specifications for this item. Since La Lune Collection’s inception in 1979, before eco-friendly became fashionable, we have been concerned about the environment and particularly about the destruction of the rainforest by the lumber and furniture industries. Many of our customers are surprised to learn that La Lune Collection just may be the most eco-friendly furniture company in the world. 1. La Lune harvests only fast growing and invasive wood species such as poplar and willow for the production of all its products. La Lune harvesting is actually beneficial to the restoration of bio-diversity to forests which have been previously clear cut by the lumber industry. 2. All woods are harvested near the factory in Wisconsin, thereby reducing the negative impact and inefficiency of transportation and eliminating any impact on the rainforests of the world where much lumber is harvested by the furniture industry. 3. All harvesting is done by hand by La Lune employees in order to maintain complete control and supervision of the harvesting process. All methods of harvesting are low-tech and eco-friendly using only hand tools. No heavy logging equipment is used. 4. La Lune’s unique yet low-tech and low-processing manufacturing methods are eco-friendly and efficient. Most processes are done entirely by hand using environmentally sound and efficient manufacturing methods. These methods, although sometimes slower, use little energy and generate virtually no waste or pollution, just like a simple low-tech bicycle is slower but much more energy efficient and eco-friendly than any high-tech automobile. 5. The turn of the century La Lune factory buildings and machinery have been carefully re-cycled and re-stored incorporating high efficient use of energy. The La Lune factory and most of its machines and equipment date back to the early 1900’s. Wood and other waste products are used to fire the kiln and heat the factory building. Even wood shaving waste is used by local farmers for animal bedding. 6. La Lune carries no inventory of furniture and manufactures “just in time” as items are sold. This efficient “just in time” manufacturing process reduces the expense and the inefficiencies associated with the production and storage of finished inventory. La Lune markets and sells its products only in the US and Canada in order to reduce the shipping distance to its clients. 7. All La Lune finishes are non-polluting, non-toxic, non-flammable, water-based finishes which are locally manufactured exclusively for La Lune. Finishes are applied in dip tanks in order to eliminate the air born pollution, energy costs, and waste products which are generated with typical spray booth applications. 8. La Lune furniture is designed and constructed to last for generations, will become tomorrow’s valuable antiques, and thereby will reduce negative environmental impact and landfill waste associated with cheaply made, disposable, non-degradable furniture. However, La Lune furniture is 100% bio-degradable, if it should someday be discarded. 9. La Lune’s human sustainability is an important part of its environmental sustainability; in 1986, La Lune relocated its operations to an abandoned factory building in a central city neighborhood now called Riverwest. La Lune has helped to restore the neighborhood by rehabbing the building, providing jobs, and opening a youth center for at-risk children near the factory in 1989. See Press and Awards. 10. La Lune’s furniture, factory, and company history provide a perfect educational tool to teach others about eco-friendly manufacturing. School and civic groups of all ages regularly tour the La Lune factory in order to learn the La Lune philosophy and process from its founder Mario Costantini. La Lune is also actively supportive of local environmental initiatives, including the UrbanEcologyCenter, located on the MilwaukeeRiver a few blocks from the La Lune factory. Prices for all seating include your choice of one of our twenty La Lune Collection indoor/outdoor fabrics or in the Customer’s Own Material (COM). In ordinary fabrics, dyes are added to the surface of the yarn or fabric. The color only penetrates the outer layer and washes out or fades away over time. The color in La Lune yarn-dyed fabrics penetrates all the way to the core, ensuring years of vibrant color and performance. Our color-to-the-core process makes our fabrics easy to clean. Most spills can be removed with mild soapy water and a soft bristle brush. For really tough stains, you can resort to cleaning with bleach. See La Lune Fabrics Care and Cleaning below. The fabric photos shown in this website are an approximation of the fabric colors available. If you wish, you may contact us to request actual fabric cuttings. Determine the total amount of fabric you will need. The COM yardage is indicated with the specifications for each item. Indicate on your COM package your name, contact information, order number, the item(s) to which your COM is to be applied, and any special instructions. If possible, print and include a copy of your order with the COM fabric. La Lune will cut and apply all COM in the best and most appropriate manner, unless special cutting and/or layout instructions are specified on the order. The COM yardage indicated with each item is for a single item using 54” wide plain fabric. Allow additional yardage for fabrics that have patterns requiring matching or fabrics that are narrower than 54” wide. Less yardage may be required on orders with multiple items in the same fabric. Please contact us with any questions regarding COM or yardage requirements. In addition to selecting any of our twenty La Lune Collection fabrics, or sending us your COM (Customer’s Own Material), you may also select any of the fabrics from the Sunbrella indoor/outdoor upholstery line at a surcharge. If you wish to specify a Sunbrella fabric, simply visit the Sunbrella website and let us know your selection(s). We will quote the cost of your order made using the Sunbrella fabrics of your choice. See Sunbrella Website. Please contact us with any questions regarding specifying Sunbrella fabrics for your order. Please contact us regarding availability and pricing on all seating options. Not all options are available on all items. All seating is available in custom dimensions, designs, finishes, and options including seating to the customer’s design. See Custom Seating. Please contact us regarding availability and pricing on all custom seating options. Not all options are available on all items. Custom options are available only to the trade. All seating is handmade using locally harvested willow, poplar, or cedar woods using sustainable, efficient, and extremely eco-friendly manufacturing methods. See Eco-friendly. The Natural Finish on Bark (N) is willow and/or poplar wood with bark, which is finished with a clear satin finish. The Premium Finishes on Bark (P) are willow and/or poplar that has been stained in a color and finished with a clear satin finish. Premium Finish Peeled (P) is poplar and/or cedar with the bark hand peeled then stained in a color and finished with a clear satin finish. Variations in finish color and texture will occur due to the natural characteristics of the wood. Some cracking, flaking, or checking may occur; however, this is a natural characteristic of these woods and will not affect the structural integrity of the furniture. Please advise on your order if you wish to match a finish or an item(s) from a previous order. The photos shown in this website are an approximation of the finish colors available. Please contact us to request actual wood and finish samples. When ordering for outdoor use, please advise at check-out if the furniture will be used “completely outdoors” or “outdoors under cover” (under a roofed in area). 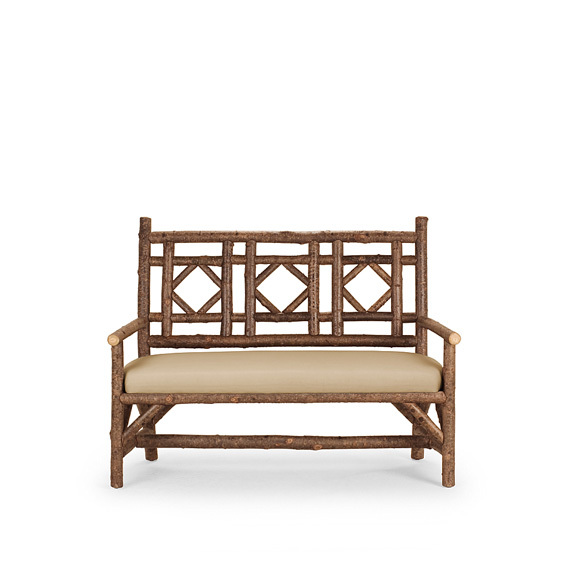 If seating is specified for any type of outdoor use, then the seat cushions will be made with outdoor grade fabric and fill, and the deck below the seat cushion will be made of wood spindles. The natural finish on bark and the premium finishes on bark may be used “outdoors under cover” but not recommended for “completely outdoors”. The peeled bark finishes may be used in any outdoor installation, unless otherwise noted on the Overview Tab for each item. All orders specified for “completely outdoors” will be made with peeled bark cedar. All cedar furniture will have some checking and cracking, however, this is a natural characteristic of cedar and will not affect the structural integrity of the furniture. Please contact us with any questions regarding our woods and finishes, or outdoor use and maintenance. See Outdoor Use tab above for additional information. La Lune seating and the entire La Lune Collection line is designed and constructed to withstand heavy commercial use. La Lune Collection seating has stood the test of time for over 30 years in the most demanding installations including restaurants, hotels, casinos, coffee shops, theme parks, shopping malls, hospitals, and retail stores. See Commercial Use. La Lune warrants to the original purchaser, that each piece of La Lune furniture will be free from defects in materials and workmanship given normal indoor residential or commercial use for a period of one year. Please inquire regarding contract pricing, delivery time, custom designs, and any other commercial questions. See list of Commercial Installations. No maintenance is required for indoor use. All woods may cleaned by using furniture polish or a damp cloth. When ordering for outdoor use, please advise at check-out if the furniture will be “completely outdoors” or “outdoors under cover” (under a roofed area). See Outdoor Use tab above for additional information. The Natural Finish on Bark (N) and the Premium Finish on Bark (P) may be used outdoors, but only if the furniture is used under a roofed-in area and protected from the weather. All items which are available in the peeled bark finishes may be used outdoors. When used outdoors, the furniture should be resealed at least once per year with a clear exterior varnish and should be stored indoors during the winter months. One of the best ways to keep La Lune fabrics looking good and to delay deep or vigorous cleanings is to properly maintain the fabrics. This can be accomplished by simply brushing off dirt before it becomes embedded in the fabrics, wiping up spills as soon as they occur, or spot cleaning soon after stains occur. Brush off any loose dirt. Prepare a cleaning solution of 2 ounces (1/4 cup) mild detergent, such as Woolite or Dawn dishwashing liquid, per gallon of lukewarm water. Use a sponge or a soft bristle brush to clean. Allow cleaning solution to soak into fabric. Rinse thoroughly to remove all detergent residue. Allow fabric to air dry. Apply a light mist of mild detergent and water using a spray bottle. Work the solution into the stain by lightly scrubbing the area with a sponge or very soft bristle brush. Blot excess moisture with a clean, soft towel or sponge. Wet-vacuum or blot excess water. Air dry, repeat steps 3 and 4 until all detergent residue is removed. Remove cushion covers and soak fabric in a solution of 1/4 cup mild detergent per gallon of lukewarm water. Use a sponge or a soft bristle brush as necessary. Remove cushion covers and machine wash in cold water. Depending on wash load size, use normal amounts of mild laundry detergent and add 8 ounces (1 cup) of bleach. Prepare a solution of 8 ounces (1 cup) of bleach and 2 ounces (1/4 cup) of mild detergent per gallon of clean water. Spray on entire area and allow to soak into the fabric for 15 minutes. Remove stain with a sponge, clean towel or very soft bristle brush. If stain and/or mildew are severe, bleach quantities may be increased. La Lune fabrics air-dry very quickly. Machine drying is not necessary. If fabric has some wrinkling, use an iron, if necessary, but only on the synthetic setting. As some irons exceed the recommended temperature on the synthetic setting, test a small inconspicuous area before ironing entire piece. DO NOT use a steamer or iron set to steam setting. Since our furniture is handcrafted, there will be some variations in sizes, woods, designs, colors, textures, construction, fabric and leather dye lots etc. All measurements are taken at the furthest (largest) point on each item. When ordering please measure to ensure that all items will clear through entryways, stairways and/or elevators. All items in the La Lune Collection are designed and constructed for commercial or residential use. Please contact us if you have any questions regarding product design or dimensions. La Lune will accept reasonable order changes subject to our ability to conform to the change requested, however, we are not required to accept changes requested after order confirmation. Changes may result in the re-scheduling of your order and may be subject to additional charges. The acceptance of an order by La Lune is final and binding and is not subject to cancellation by the customer without the written consent of La Lune. A cancellation fee of from 25% to the total amount of the order is applicable on all cancelled orders. Because your order is hand-made just for you, only defective or damaged merchandise can be returned. Please contact us if you have any questions regarding changes, returns, or cancellations. La Lune warrants to the original purchaser that each piece of La Lune furniture will be free from defects in materials and workmanship given normal indoor residential or commercial use for a period of one year. This warranty does not cover outdoor use due to variables such as weather, maintenance, pests, and other elements that are not under our control. Please contact us if you have any questions regarding our product warranty. All of us at La Lune Collection express our sincere gratitude for your patronage and support during the last 34 years. We believe that our success has been built on creative and functional designs, on our incomparable quality, and on exceptional service to our customers. We pledge to deliver to you the very best rustic furniture possible. If at any time you have a question or problem which has not been resolved to your satisfaction, please contact Mario Costantini, President. We are always very grateful for your comments and suggestions. At check-out you will be asked to specify if you are planning to use the furniture Outdoors Under Cover (under a roofed area), or Completely Outdoors (without a roof overhead). Your order will made accordingly, as indicated on the Outdoors Under Cover, or Completely Outdoors sections below. Please contact us with any questions regarding ordering for outdoor use. If you are planning to use La Lune Seating under a covered or roofed-in area you may select any of the available finishes and fabrics shown with each item. If seating is specified for outdoor under cover, the seat cushions will be made with our outdoor grade fabric and fill, and the deck below the seat cushion will be made of wood spindles. All outdoor seating will be made with removable loose seat and back cushions rather than tight-upholstered seats and backs. 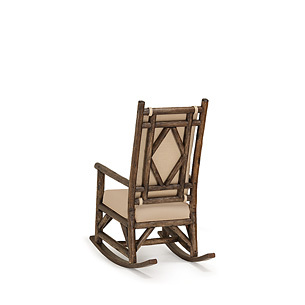 A few items in the seating collection are not recommended for outdoor use, as indicated on the Overview Tab for those items. When ordering, at check-out please select the option Outdoors Under Cover when prompted. Please contact us with any questions regarding outdoor use and maintenance. If you are planning to use La Lune Seating completely outdoors without any protection you may select any of our fabrics but only the peeled bark finishes. The finishes with the bark on are not recommended to be used completely outdoors. If seating is specified for completely outdoors the seat cushions will be made with outdoor grade fabric and fill, and the deck below the seat cushion will be made of wood spindles. All orders specified for Completely Outdoors will be made with peeled bark cedar. All cedar furniture will have some checking and cracking, however, this is a natural characteristic of cedar and will not affect the structural integrity of the furniture. When ordering, at check-out please select the option Completely Outdoors when prompted. When used outdoors, the furniture should be resealed at least once per year with a clear exterior wood varnish (such as Varathane varnish) and should be stored indoors during the winter months, if possible. The varnish may be sprayed or brushed on. All orders will be boxed or crated for shipping. Shipping charges are based on zip code, item(s), weight, and the delivery services required, and represent our cost from our preferred carriers. Shipping costs will be calculated at checkout. Shipping is to the continental United States. Please contact us to inquire regarding shipments to Hawaii, Alaska, or Canada. Unless La Lune advises otherwise, the normal delivery time on residential orders is 6 to 8 weeks. Please contact us to inquire regarding our ability to comply with rush orders. The delivery time for all commercial orders is quoted individually. Small orders ship via UPS. All orders shipping UPS must be shipped to a physical address, not a P.O. Box. Larger items will be shipped motor freight delivery. Our Standard Freight Delivery Service will deliver your furniture to the curb. Heavier items may require your assistance if one person cannot move them. This service does not include unpacking, placing the item, or moving it up or down stairs. Freight deliveries will be delivered on a pallet or in a box which you must dispose. The carrier will contact you by telephone several days in advance to schedule a specific day and an estimated delivery time. Please be sure to be available for at least a 4 hour window. If you miss the delivery, the freight company will charge you an additional fee for redelivery. Delivery is not available on weekends or national holidays. Our Optional Threshold Delivery Service will deliver your items to the ground floor doorway, garage or covered area. Larger items may require your assistance. Additional fees for threshold delivery also apply for residences with multiple steps to their door. Threshold delivery to an apartment building is to the first door of the building. Disposal of packing materials, cartons and pallets are your responsibility. Additional charges will apply. The carrier will contact you by telephone several days in advance to schedule a specific day and an estimated delivery time. Please be sure to be available for at least a 4 hour window. If you miss the delivery, the freight company will charge you an additional fee for redelivery. Delivery is not available on weekends or national holidays. Please contact us to order or inquire regarding our Residential Threshold Delivery service. Our Optional White Glove Delivery includes delivery, set up in your room of choice, and the removal of all packing material. White Glove service is not available in all areas. Additional charges apply. Please contact us to order or inquire regarding our White Glove service. When specifying a business address, please advise if it is dock or non-dock delivery, provide contact name and phone number, and add any special delivery instructions. Please note additional charges may apply for delivery to construction sites, schools, hotels, shopping malls, ranches etc. Please inspect all merchandise carefully before signing the delivery receipt (the Bill of Lading). In the unlikely event of damage please note the damage on the delivery receipt before signing and save all packing materials. If the shipment is not delivered in accordance with the quantity of packages shown on the delivery receipt do not sign for or accept the shipment until such shortages are noted on the delivery receipt (the Bill of Lading). Please contact us for assistance with any damage or returns. Claims for loss or damage are valid only when La Lune is notified within three days from the delivery date. 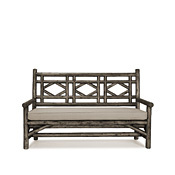 La Lune Collection is the leading manufacturer of high end rustic furniture. For over 35 years we have produced the finest handcrafted, designer rustic furniture, using willow, poplar, aspen, cedar, white birch, pine and other woods. 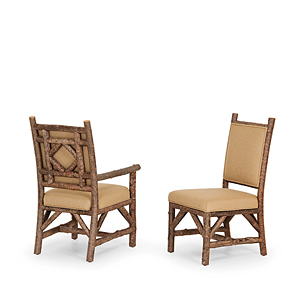 Our collection has over 600 designs of chairs, sofas, cabinets, tables, beds, and accessories, and is ideal for commercial and residential installations, indoor or outdoor use, in homes, cabins, lodges, resorts, restaurants, hotels, and more.